Plant Biotechnology: Current and Future Uses of Genetically Modified Crops covers in detail the development, use and regulation of GM crops. Split into three sections, Part 1 introduces GM crops and describes the GM crops that are used commercially. Part 2 looks at new developments and methodologies in areas including potential applications of GM crops for the production of vaccines, enhanced nutritional value of GM food, and engineering resistance to fungal pathogens. Part 3 concludes by considering the key issues of safety and legislation, including allergenicity, environmental impacts, risk assessment and labelling. 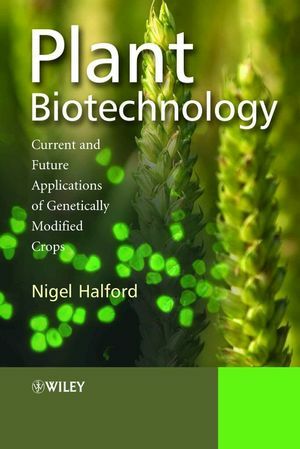 This book is essential reading for postgraduates and researchers in plant biotechnology and related sciences in Departments of Plant Science, Biotechnology, Bioscience, Environmental Science, Food Biosciences and Chemistry. It is also of interest for professionals working in the plant biotechnology industry or government professionals working in environmental policy. Dr. Nigel Halford is principal research scientist in the Crop Performance and Improvement Division at Rothamsted Research (a BBSRC centre). He has achieved renown as an expert in the GM field, and has strong collaborative research links within academia and industry, and is regularly involved in public debates on GM crops. 2.3 The Production of Long-Chain Polyunsaturated Fatty Acids in Transgenic Plants (Louise V. Michaelson, Fr&eacute;d&eacute;ric Beaudoin, Olga Sayanova and Johnathan A. Napier). 2.6 Production of Vaccines in GM Plants (Liz Nicholson, M. Carmen Can˜izares and George P. Lomonossoff).